With all of my sons, and their families, now living out of state, I tend to make more thinking of you cards with birthdays running a close second. I always leave them blank so I can write a short note to whomever the card is intended. Here's the latest one for my stash. I love the sketch and the soft colors. The sketch I used is from the CAS Colours & Sketches Challenge. I loved the simplicity of this sketch. It had so many possibilities but I decided to stay with the original orientation. The colors I used are from the Retro Rubber Challenge. For me, the soft, muted colors were the draw and they reflected well in the patterned paper I used. I love that sentiment from the Sheltering Tree stamp set by Stampin' Up! It was in the 2015 Occasions Catalog and is now in the current Annual Catalog. I like that you've used the colours in a soft and wistful way. It suits the sentiment perfectly. The little scatter of translucent drops is a nice touch. 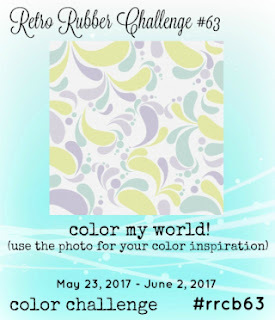 Thanks for joining us at Retro Rubber for our colour challenge. Very pretty card. I like the mix of patterns and the soft colors. Thanks for playing along with us at CC&S. So, so pretty, Marsha! I love the colors you chose from our inspiration photo. Pairing it with your sketch makes this such a delicate card and will certainly be enjoyed. Thank you for playing along with us at Retro Rubber and hope you will be back in our gallery soon. Thanks, Debbie! It was a great inspiration photo. I love the use of the soft muted colours it makes for such a pretty card! Thanks for sharing with us this week at CC&S! Clever pairing of the design with those soft colours makes for a pretty card. Thanks for joining us on this weeks CC&S challenge. Hello Marsha: Love how you took the colors of our RETRO RUBBER challenge and combined them with the sketch to create this beautiful, soft card. Thank you for playing along with us at RETRO RUBBER, hope you join us again next time. Thanks, Maria! Love Retro Rubber! I am loving the soft muted colors used with this card, Marsha! I also enjoy placing sentiments on designer papers... just gives it that extra appeal. Thanks so much for joining this week with Retro Rubber's color challenge. Always love seeing you in our gallery!! Thanks, Katy! I do, too, and don't know why I don't use more patterned papers. Thanks, Claire! I like stamping a sentiment onto patterned paper.